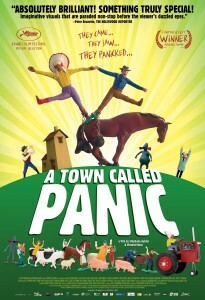 Panique au village or A town Called Panic as it was titled in English is a quirky Belgian animated movie. Its audio is in French and I watched it with English subtitles. 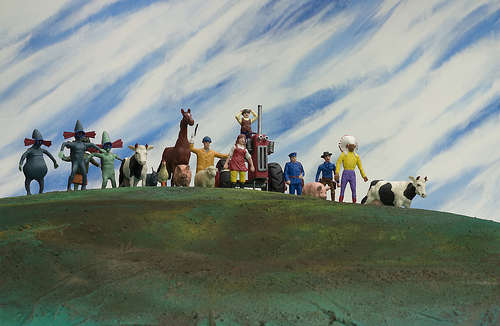 It’s a quirky movie with stop motion animation and lots of things that may seem totally absurd as you read them here. The major characters are plastic figures mounted on platforms like some toys we have as kids (or used to have. The platform has been defunct for some time in toys. )Horse, Cowboy and Indian share a house. Then there’s postman, policemen, the farmer and his wife, farm animals, Madame Longree who runs a music school, weird dishonest people who live underwater and mad scientists. 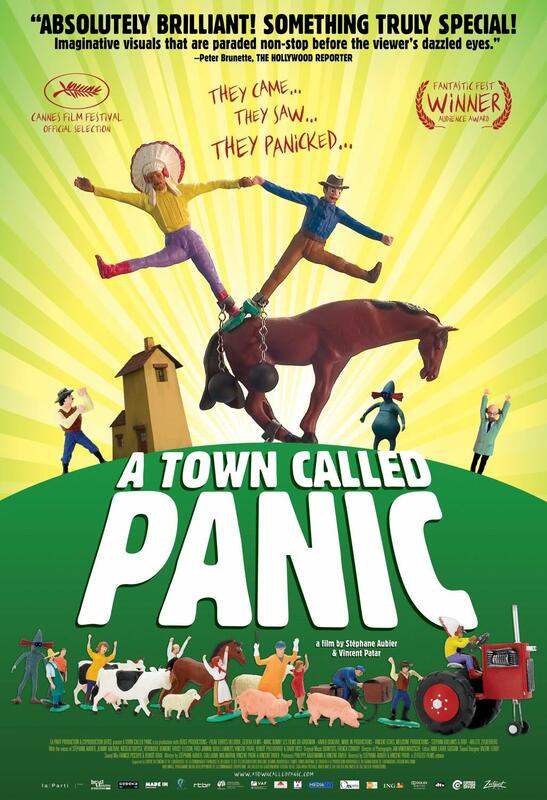 The movie is so titled as the town is in a constant state of panic especially due to the antics of the Cowboy and the Indian. They want to build a barbecue as a gift for Horse and end up ordering 50 million bricks instead of the fifty they wanted. To hide them from horse(who is like a parent figure) they hide them on top of the house while Horse is away to pick up the farmer’s farm animals(cows, pigs ,sheep and a donkey) who have gone for music lessons to Madame Longree, who is also a horse and by whom Horse seems smitten. He signs up for music lessons here and throughout the movie makes excuses for not being able to make it as he’s swept off on one adventure after another. The village members throw a party for Horse and after they leave the house collapses due to the bricks. 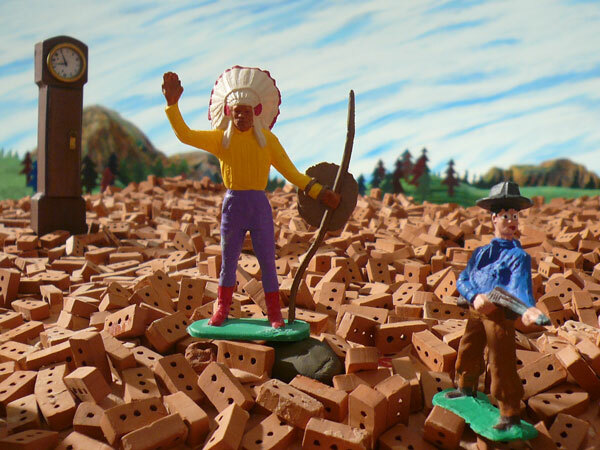 They get out in time and as Horse finds the bill for the bricks signed by the Cowboy and the Indian he makes them help him rebuild the house with all the bricks lying around. But somebody keeps stealing the walls they build. That’s when the underwater people are introduced. As they chase them they first fall towards the centre of the Earth. Then they find an opening on to a polar region. There they end up getting caught by mad scientists who just enjoy throwing snowballs from the Polar Regions on targets they see through a lens with the help of a penguin like robot. They then escape to end up getting caught in the underwater world. As they decide to take their home back they end up destroying it. Then the underwater people lay siege to the Farmer’s house above the ground. The battle that ensues sees it all-Flying cows, Flying pigs, etc etc. Finally the matters are resolved peacefully but panic is just around the corner with Cowboy and Indian around to mess things up. This movie has quirky moments spread across its whole duration and the adventures take on a surreal quality at times. There are plenty of laughs and a child like innocence to the proceedings. It appeals to not only Children but to the child within each of us. I would rate it 7.5/10 and definitely recommend a one time watch.